WHERE: 5119 N. Nebraska Ave.
WHAT: A celebration for your senses. 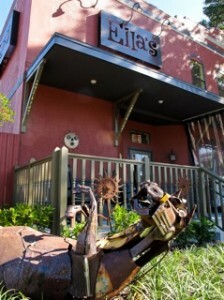 Ella’s exudes artistry in the form of quality craft foods and brews, live music performances and local sculptures, paintings and crafts. It’s a restaurant (with a performance stage) surrounded by an art gallery where you can enjoy everything outside of the cookie cutter. WHY: Because going out for dinner shouldn’t just be about satisfying hunger. At Ella’s you don’t eat to become full (although that will happen too), you eat to enjoy the delicious flavors and fresh ingredients of well-crafted, delectable dishes. WHEN (To go): Soul Food Sundays. One day of the week, Ella’s changes up their menu and offers all classic Southern Soul Foods and Kansas City Style BBQ items like Fried Chicken and Waffles, Gumbo Stuffed Peppers and Fried Catfish. WHO (To Take with You): Your first date. The eclectic art on the walls can provide a great conversation starter during possible silent, awkward moments and the designer dishes on the menu are priced right for quality food that will satisfy your date’s tastes as well as your wallet.